Last week, the New York Times was forced to issue a correction, admitting that “17 intelligence agencies” had not, in fact, accused Russia, as Hillary Clinton had once claimed. The assessment was made by four intelligence agencies — the Office of the Director of National Intelligence, the Central Intelligence Agency, the Federal Bureau of Investigation and the National Security Agency. The assessment was not approved by all 17 organizations in the American intelligence community. But Acosta, who is CNN’s Senior White House Correspondent, appears not to have read the Times. 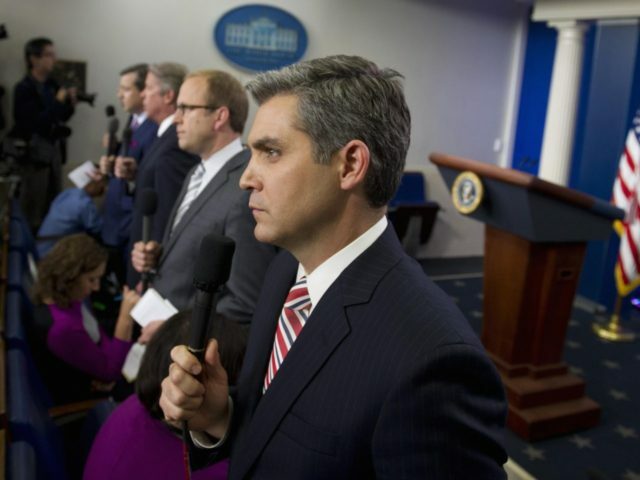 Acosta also drew ridicule on Twitter on Thursday morning for complaining that President Trump only called on one reporter in his press conference in Poland, and that the reporter — Daily Mail U.S. political editor David Martosko — was allegedly “an ally of the White House.” Martosko, whose political views could be described as center-right, briefly considered working for the administration, but was respected by all news outlets — including CNN — as the informal leader of the traveling press corps covering candidate Trump on the 2016 presidential campaign trail.